In this photo: Sec. Charlie Christopher and PP Ray Underwood making Joseph Flores an honorary member on the occasion of his being appointed as Governor of Guam in 1960. 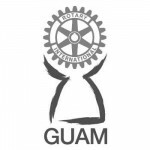 Past President Ray Underwood has the distinction of being the only member of the Rotary Club of Guam to be elected to serve four years as President. PP Ray’s terms covered the period 1951-52, 1952-53, 1956-67 and 1960-61, and although the Club records for these terms are very meager indeed, probably due to the ravished of the typhoons, PP Ray’s knowledge of Rotary was such that he was affectionately known in the Club as “Mr. Rotary”. On numerous occasions PP Ray addressed the Club on Rotary matters and his knowledge of the subject coupled with his sense of humor made the meetings extremely interesting.